Scientists have discovered a way to test for cocaine usage by simply examining a person's fingerprint. Researchers say the method is less invasive, more accurate and more hygienic than existing tests, which rely on saliva, blood or urine. Led by the University of Surrey, researchers developed a test which uses an analytical chemistry technique known as mass spectrometry – a method which has proved more accurate than those currently used by authorities. "When someone has taken cocaine, they excrete traces of benzoylecgonine and methylecgonine as they metabolize the drug, and these chemical indicators are present in fingerprint residue,” Dr. Melanie Bailey from the University of Surrey, who was involved in the research, said. In order to locate those traces, the fingerprint sample is treated with a mix of methanol and water. A mass spectrometer, which detects chemicals based on their atomic size, is then used to analyze the print. The test, which can determine whether a person has ingested the drug or simply touched it, has a number of advantages over traditional testing methods. "The beauty of this method is that, not only is it non-invasive and more hygienic than testing blood or saliva, it can't be faked,” she said, adding that the identity of the person is captured in the fingerprint ridge detail. The method also saves time. It takes just seconds to deposit a fingerprint, while drawing blood takes several minutes and requires trained staff. Tests which involve bodily fluids – such as blood, saliva, or urine – can also be biological hazards, and often require specific storage and disposal methods. Those tests must also be performed off-site, and results can take time. 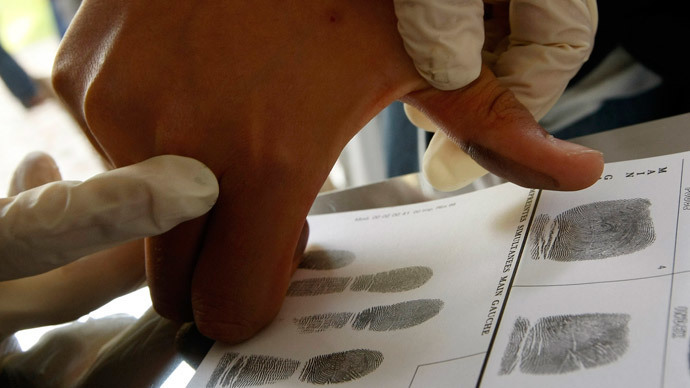 However, the scientists believe the fingerprint test could lead to the introduction of portable drug tests for law enforcement within the next decade. The test also has the potential to be used by employers at the workplace. “We are only bound by the size of the current technology,” Bailey said, adding that companies are already working on smaller versions of mass spectrometers. Bailey conducted the research alongside scientists from the Netherlands Forensic Institute, the UK's National Physical Laboratory, King's College London, and Sheffield Hallam University. The findings were published in the journal Analyst on Friday.